A valuable encyclopedia on the Cold War—one of the few available—containing a wealth of information not otherwise available in one place. Kort (Social Science/Boston Univ. ; The Soviet Colossus: A History, 1984, etc.) 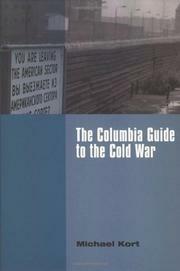 deals in a short, 96-page introductory essay with the origins and development of the Cold War, including the reasons for the deterioration of relations between the US and the Soviet Union in the immediate aftermath of the Second World War; the impact on US domestic politics; why the Cold War expanded into the Third World; dÇtente and its decline; and what factors ultimately ended it. Most useful is the discussion of the differing interpretations of the struggle, a debate between the traditionalists, who have argued that the problem lay in an expansionist Soviet Union; the revisionists, who blamed US economic expansionism, almost without regard to the Soviet dictatorship; and the post-revisionists, who rejected this economic determinism and the failure to take the Soviet threat into account, while not neglecting the security concerns of the Soviet Union. Kort holds that recent research in the Soviet archives strengthens the traditionalist and post-revisionist views. The last three sections of the volume are a collection of short biographies of the major participants, a concise chronology, and a 140-page critical bibliography of the subject, grouped by period and by topic, with comments on the utility of particular texts for instructional purposes. A very useful approach to the subject.